I am honored to have been selected as one of 18 Western artists to join with 48 leading Egyptian artists in building bridges between faiths and cultures of the Middle East and the West through Art. This ambitious initiative is in its sixth year and was initiated by CARAVAN, a humanitarian interfaith arts NGO started in Cairo. The spectacular installation will open at the National Cathedral in DC, then travel onto the Cathedral of St. John the Divine in NYC. The works will then be auctioned off at Sotheby's New York. CARAVAN develops artistic initiatives that bring together the cultures and creeds of the East and West. These include a wide range of programs and services: exhibitions, festivals, seminars, forums, lectures, concerts, screenings, exchanges, artist's representation, consulting, patronage, etc. In addition to encouraging friendship, deepening respect, enhancing understanding and facilitating sharing between the East and the West through the Arts, many of CARAVAN’s creative programs have two other sub-objectives: 1) to encourage the development of local contemporary arts and 2) to bring hope and assistance to individuals in need (economically, socially, physically) irrespective of creed through a charitable component. The 2014 CARAVAN visual art exhibition/installation will result in an unprecedented gathering of renowned Arab and Western artists coming together to use art as a bridge for intercultural and inter-religious dialogue. With the theme AMEN-A Prayer for the World, the art initiative is an aspirational expression for both the people of the Middle East and the rest of the world. 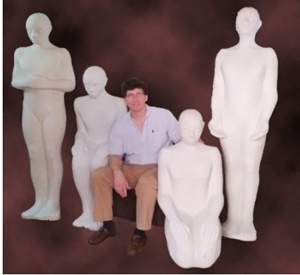 Each participating artist will receive one of four life-sized fiberglass figures in prayer with which to create a personal expression of this year's theme. Founder of CARAVAN, Paul-Gordon Chandler, with the four praying figures. I have been designated the seated figure.